PRP (Platelet Rich Plasma) is a non-surgical, non-invasive treatment for male or female pattern hair loss (androgenic alopecia) or Alopecia Areata. This procedure is available at Robert James Clinic in Beverly Hills. 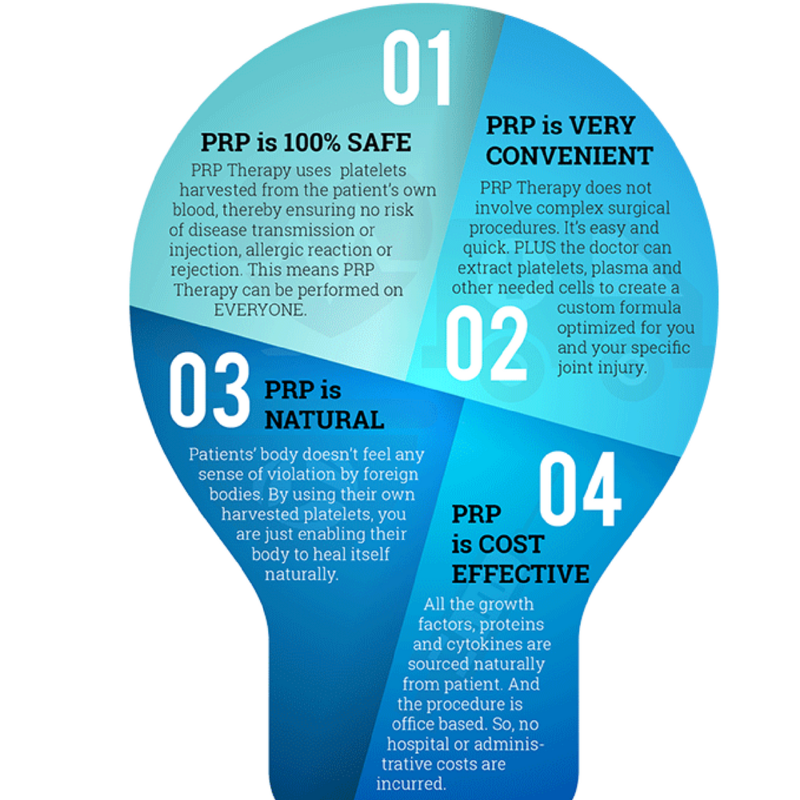 PRP is sourced from your own blood supply. Platelets repair damaged or injured cells via growth factors. Plasma carries the nutrients, vitamins etc. PRP is a concentration of healing platelets and nutrient rich plasma. At the 7th Annual World Congress for Hair Research held in Edinburgh, Scotland UK, information was presented on several occasions which supported the current theories about why PRP platelet rich plasma offers improvement in hair growth in many patients. Cytokines and growth factors locked within the platelets can be concentrated and released, then injected into the areas of alopecia (hair loss), stimulating hair regrowth. PRP was first developed in the 1970s and has since been used for years for various medical applications. 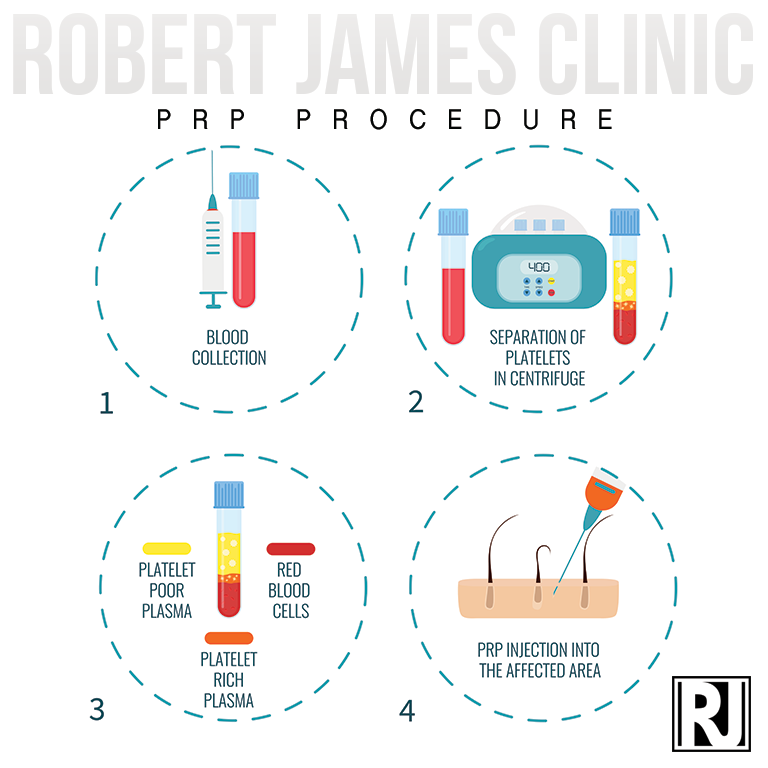 PRP involves having a blood draw as though you were getting lab tests performed. The whole blood is treated with centrifuge to separate the red blood cells from the plasma, the portion of your own blood that contains a relatively high platelet concentration. Platelets are the part of the blood that stops bleeding by clotting and clumping. Medical Directors then separate the plasma along with the platelets, activate the platelets and inject the serum into the area of your body that is being treated. Medical Directors have been using this technique for years to stimulate wound healing and improve the appearance of skin. The growth factors that are released from the activated platelets can theoretically stimulate cells in your hair follicle to grow, which is great for inactive or implanted hair follicles. ARE THERE ANY SIDE EFFECTS WITH PRP? Since PRP uses your own blood, you should not have a reaction to it. Studies have noted that PRP has been found to have a positive effect on male and female pattern hair loss without major adverse side effects. You may experience minimal pain, pinpoint bleeding, and redness when the injections are being delivered. Patients often comment on a “full” or “tight” feeling in their scalp immediately after injections that can last up to about 1 day. Rarely, some patients will complain of a mild headache the next day. Yes, the centrifuge that is harvesting the blood either completes a single spin or a double spin. Robert James Clinic uses the double spin method due to the baseline to yield being much higher producing much better results. The soft spin separates red blood cells from the plasma. the 2nd spin separates pore platlet plasma from the platlet rich plasma. PRP is injected, PPP is micro needled. The PurePRP® II is pH balanced, high yielding platelet rich plasma sample with low concentrations of red blood cells and inflammatory granulocytes. PurePRP® II is a state-of-the-art premium concentrating system, that provide viable platelets and growth factor concentrates of up to 8 times baseline in 7mL of PurePRP®. Additionally, PurePRP® II has the viscosity of plasma, allowing it to be easily applied to the treatment site with the use of small gauge needles. PurePRP® II is independently reviewed and proven to be the best performing PRP system available, when compared to the other leading brands. HOW MANY PRP SESSIONS ARE NEEDED? The hair follicle-stimulating results of PRP treatment for hair regrowth is NOT permanent. Most patients who undergo PurePRP®, require repeat treatment in about 4 months. Because hair typically grows at a rate of 1/4 inch per month it typically takes three to six months to measure the improvements from PRP using scalp analysis tools and six to twelve months to “see” results in the mirror or in photos. Over time, PRP may need to be repeated depending on the patient’s response to therapy, hair loss condition, adjunctive treatments and goals. By monitoring the hair growth over time, we can determine when the improvement in hair growth from PRP slows down or plateaus, eliminating guesswork as to when to administer PRP again. At that time, additional treatment with PRP may be necessary in order to maintain the desired results.